You probably haven’t heard about the ketogenic diet. It hasn’t garnered the media attention like Atkin’s, South Beach, or Paleo. The ketogenic diet, however, has been around since the 1920’s, and is one those in the ME/CFS and Fibro community might want to get to know. First popularized in the 1920s as an effective treatment for intractable epileptic seizures, the diet is still used today for epileptics that fail medications. It has also been widely studied as an adjuvant in cancer and other neurological disorders such as Parkinson’s, ALS, and Alzheimer’s. A Cochrane meta-analysis highlighted the safety and effectiveness of this diet for controlling seizures (1). Implementing a ketogenic diet is quite different than other big name diet plans. In order to become “keto-adapted,” the dieter must flip a switch on their metabolism. Instead of burning carbohydrate (glucose) for fuel, the cells must switch over to burning fats in the form of ketones. The downside of burning carbohydrate as fuel, is production of cellular stress and free radicals. Ketones provide a “cleaner” energy for cells and are less damaging to cell membranes. This could be compared to a car burning diesel (carbohydrate) versus a car burning unleaded gasoline (ketones). This is not to say glucose is completely absent in someone who is keto-adapted. Dietary protein can also be a source of glucose for vital organs that require constant supply, such as the brain. Too much protein however, can cause blood sugar surges that stimulate insulin and “undo” the keto-adapted state. A ketogenic diet can be initiated with a 12-72 hour fast. Then the diet is maintained by consuming 75-90% of calories as fat, with the remainder coming from moderate amounts of protein and very little carbohydrate. The ketogenic diet is one that should be considered when dealing with ME/CFS, and perhaps even Fibromyalgia. A body of research in animals and humans have highlighted some of the mechanisms by which dietary ketones promote cellular health. Here I highlight 3 compelling reasons why the ME/CFS and Fibro community should get to know ketosis. By their very nature as ATP-churning, energy machines, mitochondria produce an enormous quantity of free radicals. These radicals must be “quenched” by antioxidants to reduce the damage to the delicate organelle’s scaffolding. Glutathione, selenium, coQ10, and others play a key role in combating the free radical onslaught. Mitochondrial dysfunction is widely recognized as a contributor to ME/CFS and Fibromyalgia symptoms. Indeed, many studies have determined that patients have depleted antioxidants, leaving mitochondria particularly vulnerable (2,3). Ketogenic diets have been found to reduce free radical damage and thereby improve mitochondrial function. Also, ketogenic diets have been found to increase glutathione synthesis--the most important antioxidant for the mitochondria (5). In a recent study, fibroblasts from fibromyalgia patients were found to have decreased mitochondria per cell. When patients were given the metabolic drug metformin and prescribed caloric restriction (a means to achieve ketosis) the fibroblasts showed a more resilient response to free radical damage (4). New studies are emerging demonstrating the role of ketosis in regulating the immune system. In animal models, a 72-hour fast that increases blood ketones, stimulates hematopoetic stem cells. These are cells that will differentiate into various types of white blood cells (6). A blockbuster ME/CFS study is now underway studying the effects of the B-cell depleting drug Rituximab (7). This cancer drug may provide relief for a subset of patients through similar mechanisms as ketosis—out with the dysfunctional immune cells, in with new. Rituximab has also been studied in autoimmune diseases such as RA. Fasting studies in RA patients demonstrated reduced joint pain and inflammation, which suggests a similar mechanism (10). Promoting a ketogenic state during the use of Rituximab may make the drug better tolerated and promote a more robust immune response. Ketogenic diets, achieved through fasting, are being studied as a cancer adjuvant to lessen the toxic effects of traditional chemotherapy in various cancers (10). 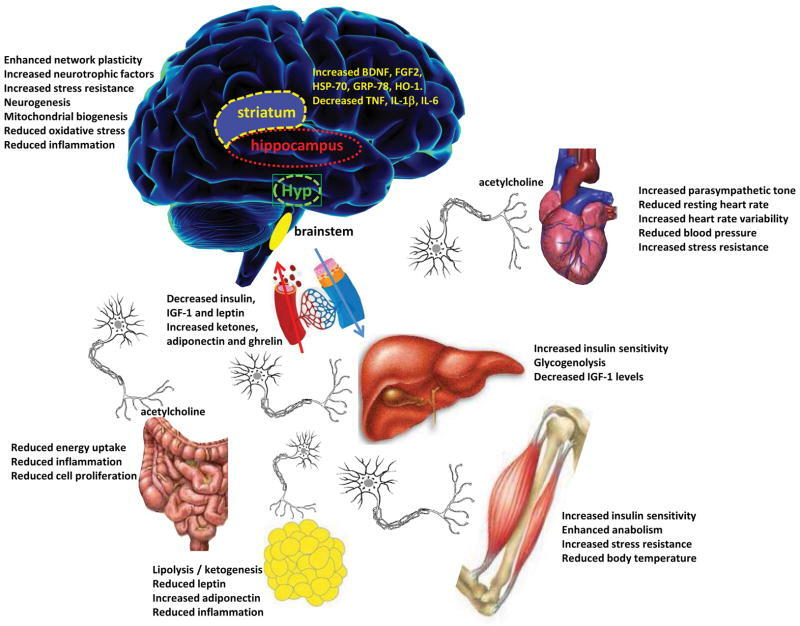 The topic of neuroinflammation in ME/CFS is starting to gain traction as new research emerges. A Japanese group detected neuroinflammation on PET imaging (8). Newcomer Jarred Younger detected high levels of the pro-inflammatory molecule leptin in a cohort of patients (9). The effects of leptin occur in the brain and may promote “sickness behavior,” or more commonly, malaise. Animal models of ME/CFS have also demonstrated neuroinflammation driven by inflammatory antiviral molecules, like IFNγ. Increased IFNγ has been a consistent, yet non-specific, finding among ME/CFS research (2). Ketones have demonstrated their ability to down regulate IFNγ and reduce leptin (10). Other pro-inflammatory cytokines have been shown to reduce in a ketotic state; IL-6 and IL-1β. Finally, ketogenic diets increase the production of BDNF in the brain, which stimulates neuronal stem cells and repairs damaged neuronal connections--a potential perpetrator of the dreaded brain fog (10).